Andhra Pradesh Power Generation Co. ltd.
Andrew Yule & Co. Ltd.
We, Anchor Cork Private Limited, started in the years 1993, are one of the foremost manufacturers, exporters, importers and wholesalers an extensive array of Gift Accessories & Cork Products. Our offered range consists of best grade Rubberized Cork Products, Stationaries and Tableware. To manufacturing these offered products in compliance with the set industry standards, our experienced professionals use the modern machines and tools. Our products are appreciated for their features like easy usability, high strength, and longer service life. We export Globally. Our company has established up to date infrastructural set-up, where all facilities related to our business domain have been installed by us. It has various departments like production, quality control, and others, which helps us in performing our business process in the best possible way. Our company also ensures the quality of the offered products before final dispatch at the customer end. Apart from this, our ethical business practices, customization facility, timely delivery and wide distribution network have made us popular with the clients. We deal in our brand name i.e Cork Craft and Anchor. Under the direction of our mentor, Mr. Parag Vora, we have been able to create a huge patron. With the help of his sharp business approach and skills, we have gained a top position in the market. 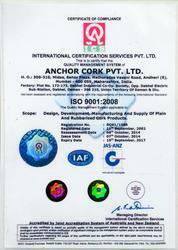 We, an ISO 9001:2008 certified company, aim at providing our customers with products of optimum quality. We have a quality control department where quality inspector ensures complete inspection of products. Our product is eco-friendly and has a never ending potential of applications. Being a client focused organization; we are providing superior quality gift accessories & cork products to our clients. Owing to our high-quality products, we have gained a top position in this domain. We are also customizing this range of product as per the specifications detailed by the clients. Apart from this, we try to satisfy our clients by offering them best quality product array. We offer a wide range of high quality rubber cork products perfectly used in diverse industries. Our product includes composition cork, rubberized cork sheets, anti vibration pads, rubberized cork strips, frames & gaskets, granulated cork, gift articles, designer cork and cork powder. We make efforts and try to provide best service. Our constant innovation, evolution and a zest to introduce new and improved products has kept us in the forefront of domestic and international market. Over the years we have made a long list of client base all over the world. We facilitate the availability of free samples and Our products are well appreciated and offer best as per the client’s specifications. Our organization is known to be one of the trustworthy manufacturers, importers, exporters and wholesalers of the gift accessories & cork products. For the aim of maintaining industry norms, we made these products through a series of predefined quality checks. Our company takes pride in providing products of superior quality at very affordable rates. Our team of hardworking employees is the driving force that has led to the path of success. These professionals work in close coordination with each other and complete the assigned task with perfection. Further, to keep our professionals updated with the changing technology and market conditions, we arrange training sessions on regular basis.